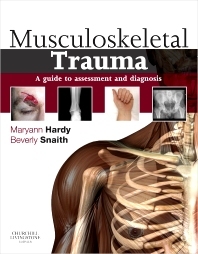 Musculoskeletal Trauma: a guide to assessment and diagnosis is a clinically focused text following patient journey from presentation to diagnosis in musculoskeletal trauma. An understanding of this process is essential to ensure that clinical assessment and diagnostic examinations inform decision making and effectively and efficiently optimize patient care. This text is particularly timely given the increasing blurring of professional boundaries within the emergency care setting and need for practitioners recognise the contribution of all professions to the patient care pathway and enhance interdisciplinary communication. Written by an experienced multiprofessional clinical team, the book systematically guides the practitioner from musculoskeletal injury mechanisms, through clinical presentation and assessment, radiographic imaging and interpretation, to the formulation of a diagnosis. It is a coherent, logical and informative guide to contemporary practice for all emergency health care practitioners. An introduction is provided to the principles of clinical assessment and radiographic technique. Radiographic images are provided alongside photographs of radiographic positioning to enhance understanding of anatomical relationships and image appearances. In addition, images of both clinical presentation and radiographic features of trauma are provided to enhance understanding of clinical signs and symptoms of trauma and support accurate decision-making. Whilst conventional imaging remains the mainstay for early diagnosis in the emergency department, the contribution of other imaging modalities (in particular CT, MRI & ultrasound) are explored and illustrated with appropriate clinical cases.